Call or stop in for a Free Estimate! In our central heating and air conditioning department we custom build our own ductwork for optimum air flow and efficiency of your HVAC system. We install and service quality Amana, Lennox & Mitsubishi Heat Pumps. Click on the pictures below to go to their sites for more details on these quality products! Click here to go to Amana Heat Pump page. 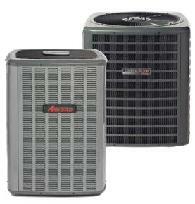 Click here to go to Lennox Heat Pump page. How a Heat Pump Works! Fueled by electricity, heat pumps are used to either heat or cool your home by transferring heat between two reservoir. In the warmer months the heat pump acts like an air conditioner, moving heat from inside your home to the outside. During winter, heat from outdoors is transferred to the interior of your home. Manufacturers believe that even on a 32* - Fahrenheit day it produces enough heat to warm a home. Dale tends not to agree with this and feels that this is when your home's furnace should come into play, unless you have heat pump with inverter technology and is designed to go into the negative temperatures. For more details give us a call at (715)284-5931. Remember we are trying to build lasting relationships so we are ALWAYS striving to do our best for you. We won't try to talk you into anything you don't need for your home. You have our word on it! We are a company that stands behind its word and work!